Last week, IHE Delft hosted 9 summer courses on a variety of cross-cutting topics. The five-day courses started on Monday 30 July and were meant to bring together junior and mid-career professionals with different academic or professional backgrounds. Topics included water diplomacy, leadership, gender and serious gaming. Games are being used more and more as innovative ways to enable discussion and learning. 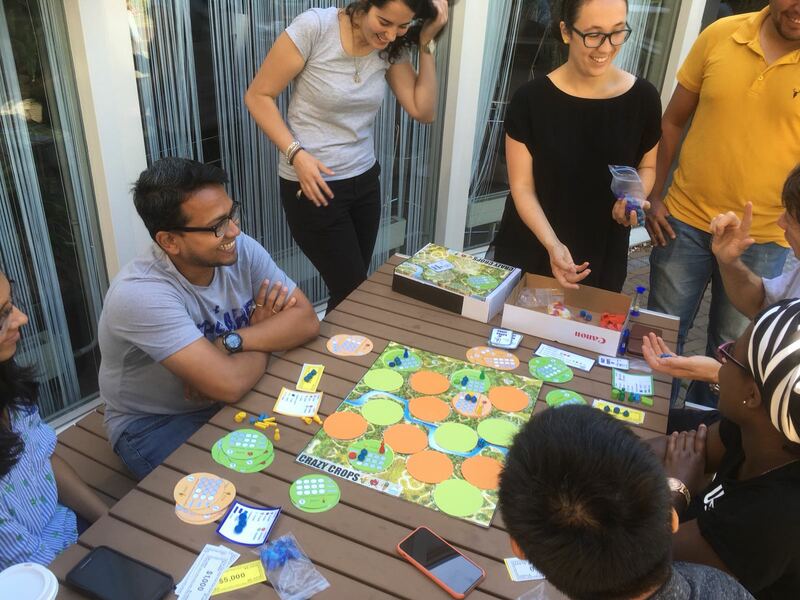 In this course, participants learned how to think critically about games, how to use them, and how to design their own. During the week, all three games grew from sketches to real, playable games. Players can plan their irrigation strategy to build their farming empire in “Crazy Crops”, designed as a teaching aid for agronomy courses. Or, they can try to balance their water needs with other users in “Water War”, an online game aimed at raising awareness of upstream-downstream inequalities. They can even try to escape a flood (with their dog) in “Escape Plan”, an evacuation training game for citizens of flood-prone cities. The games were exhibited at the closing session of the summer courses, where they attracted plenty of enthusiastic players (and led to a couple of nail-bitingly tense moments). The course was coordinated by Gerald Corzo Perez, Janez Susnik and Joanne Craven. The course teaches students to recognize how the use, management and knowledge of water are gendered. Different tools and concepts to identify and explain this 'genderedness' were discussed to understand its implications for equity, sustainability and efficiency. The course was coordinated by Tatiana Acevedo Guerrero. ‘The summer course on “questions of gender in water” was very interesting. As an engineer I learnt that we have to consider gender in our projects design so that they become efficient and sustainable. For water and sanitation projects women should be given an opportunity to be part of the decision makers,’ says MSc student Ms. Theophile Iriho. The course gave more insights in water reservoirs. Reservoirs help to shift water in time. In light of the current climate change uncertainties drought duration are becoming more prolonged. Thus, storage of water is necessary to ensure sufficient water supply for livelihoods. It is important to ensure sustainable sediment management for reservoir in order to convert it to a renewable resource. The concept is to shift from design life approach to life cycle management approach. This ensures that the needs of the future generation are taken into account thus sustainable development. During the week, participants were introduced to various mechanisms of sediment management. Lectures were offered by guest speakers with a lot of expertise in the field, having been involved in various projects worldwide. In addition, they presented case studies of their projects to enhance our understanding of the subject. The participants were exposed to various models (RESCON) which help in deciding which sediment management option is feasible. This model is very helpful because it allows to include cost implications as well as environmental impacts of possible options. In general, the course was informative and very relevant to students who have interest in reservoir/dams. Course coordinator Mario Franca. Nature Based Solutions is an emerging concept that covers a range of approaches and technologies that use natural processes to address societal challenges. The guest lectures and the different topics covered in this summer course were relevant from a practical perspective and they highlighted different knowledge and experiences. The fieldtrip was meaningful and it was directly related to the aspects studied in the classroom. It helped to see the application of the nature based solutions proposed and how they were actually being implemented, as well as the process involved to achieve the goals. The course was structured in two main parts: classroom based teaching about nature based solutions in water management: with lectures, a fieldtrip, and an integrated project to conduct a development plan for an Island called Borginia in a sustainable way by applying nature based solutions. The development plan was manifested at the end of the module via poster presentations made by 4 groups. The Building with Nature project (BwN) is a part of the Interreg North Sea Region Programme 2014 - 2020. How to build a communication bridge between experts and learners, is a critical issue for this project. Through the Nature based Solutions summer course, this challenge could be practiced and participants' feedback provided valuable input. In addition, feedback from the summer course can help the BwN project to develop a stronger link between knowledge supply and demand. Course coordinator is Chris Zevenbergen. The summer course on ‘water cooperation and diplomacy’ was the first joint activity of the team working on water cooperation and diplomacy at IHE Delft; since one month the team consists of Jenniver Sehring, Rozemarijn ter Horst (course coordinator of summer course), Susanne Schmeier and Zaki Shubber. The compatible expertise and enthusiasm of the lecturers resulted in a successful and valuable learning experience for the participants. The course introduced IHE Delft’s students and external participants to different concepts of water cooperation and diplomacy, the underlying theories and insights in diplomatic processes, and allowed for students to apply relevant tools and skills in a safe environment. Theory was alternated by group work and exercises. In an interview setting, the participants asked the lecturers and guest lecturer Lesha Witmer about their experiences in negotiations and water diplomacy. Based on conflict and stakeholder analysis tools, the participants presented excellent analyses of cases of water cooperation and conflict. They were challenged to define advice to negotiators, and were able to apply the lessons in a negotiation simulation hosted by SIWI. After the course, the participants indicated to have a better understanding of the complex dynamics around transboundary water governance and water diplomacy, as well as the role of individuals and organisations working in the field. An example of one of the exercises, challenging the students to work together, can be seen here, to view photos of the course click here.